Life finds a way. The singularly iconic phrase from the original Jurassic Park movie is both trite and true in terms of unexpected evolution, but there is evidence of this everywhere. 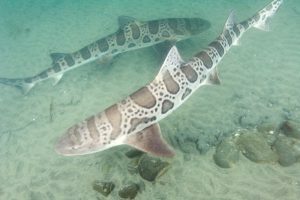 Today, the evidence comes in the form of a female leopard shark who has given birth despite the fact that she has been without a mate for the past four years. Her name is Leonie. She lives at the Reef HQ aquarium in Townsville, Queensland. At the aquarium she successfully bore children with her mate between 1999 and 2012 until the staff separated the pair to slow down breeding. Two years after the separation, however, the leopard shark began laying eggs with embryos inside. This means that, somehow, they have been fertilized. Dudgeon goes on to say, that obviously sperm storage was one possible explanation. There is solid, documented evidence of female sharks storing their mate’s sperm for long periods of time. However, the other possible explanation was parthenogenesis, she explains. This is asexual reproduction and it is something they had only seen in maybe a half dozen sharks—but none of those examples had every previously mated.